A few weeks ago we had the pleasure of interviewing Abby Jones and got a tour of the lovely home that she and her husband Stuart renovated. We are so excited to share pictures of their home and the transformation that took place in the 8 months of hard work that it took to make this house their home. After several years of renting, Stuart and Abby took the plunge and bought a house from a friend. The house was a project. With a rumored condemnation order on the house, graffiti covered walls, and an unpleasant smell, it was quite the undertaking. Abby shared that walking through the house for the first time, they were quickly able to envision a restoration. 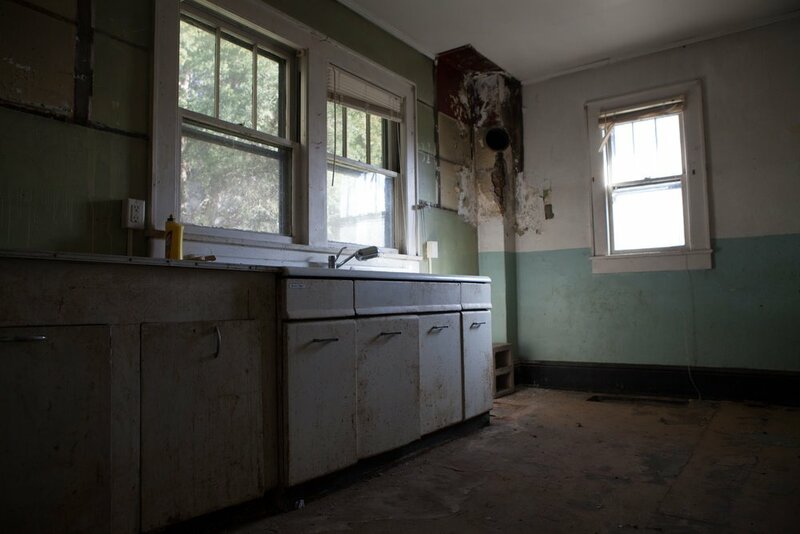 It had good bones, french doors, "disney princess" windows, and buried under the muck, some beautiful floors. One of the biggest selling points for them was the lofted bonus room that they have designated the Prayer Room. Abby and Stuart share the prayer room with their community as a way to offer a space to rest, pray, or worship. I asked Abby what home means to her and she shared that to her, home means rest. Abby's desire is to cultivate a space where people come in and feel that they can be themselves. As Abby and Stuart are small business owners, work is busy, stressful, and can become consuming--home is where they unwind and get away from the daily grind. Abby said it perfectly when she said, "our home is a facilitation of community and relationship". They chose their home for many reasons but one being that several of their friends are now their neighbors. One habit they have started is meal sharing with those neighbors. After realizing that sharing the work and only having to cook one night a week would benefit everyone, they came up with a plan. 6 nights a week, a meal is cooked by one of the neighbors to feed 12 people. Each neighbor takes a night and cooks a simple healthy meal. Often times everyone ends up eating together but some nights the food is disbursed between everyone. It's become an awesome tradition that makes it easier to spend intentional time with those they love and share life with. Here are a few of the questions I asked Abby in reference to her home. How would you describe your style of decorating? I would say that it has changed over the years. In 2012, when we first got married, I was more into the cozy, antique look. When we started designing this house I realized that I actually gravitate towards clean lines and more modern elements. We don't have much storage at this house and I knew I didn't want to clutter it up so we have kept things pretty minimal. One of the best decisions we made with this house was to wait to fill it. We took the time to figure out what we really wanted and saved for more quality items. We still have some antique items incorporated into our home along with our new purchases. Our dining room table was gifted to us by my parents. It was my grandmothers and I ate all of my meals around it as a child. We love pieces that have a story and meaning but also have discovered that we love to buy new things together. What is your relationship to your belongings? It's a bit of a mix. Some pieces have been in my family for generations. For example, I have a quilt that was my grandmothers when she first became a mom. I love the deep significance of items with a story. It's all about casting vision for what you enjoy--marrying the pieces of deep meaning with the pieces that you just really like. I love the idea of passing pieces to my own children one day. Stuart and I have been really intentional about what we keep and about what we buy so our furniture and belongings really mean something to us. I do all my recipe testing, recipe development, pictures and video in our home. It doesn’t feel like work at this point, it mostly it feels like creating. I think I’ve tried to keep it that way because I don’t want it to feel like a chore. For me, cooking/baking is my creative outlet, it’s how I get my alone time. Creating great tasting and beautiful food is restful for me. When we lived in the old city, Stuart worked from our studio apartment but as we are both introverts, we realized that separate time is really good for us. Stuart now has an office away from home which helps us draw the boundary of being able to leave work at work and rest at home. Having the two separate spaces has been really life giving. How is your home an extension of yourself or your family? I love hosting and I love creating. Our home allows me to do those things on a daily basis. We have great lighting for being able to shoot for my food blog, we have a prayer room that is designated communal space for our friends and neighbors and we have a layout that is conducive to hosting our people. Our home, specifically, our prayer room is a reflection of what our heart is- to provide space for community, creativity, and rest. Thank you Abby and Stuart for letting Help You Dwell share your renovation journey and your beautiful home with our readers!